BMW doesn’t offer a stick on their current G11 7 Series here in the States, but they once did on the original E23. Today’s Nice Price or Crack Pipe 733i rocks that five-speed, but you’ll have to decide if its price means the seller is trying to stick it to you. Speaking of manual transmissions, as we are wont to do, yesterday’s coolio 1978 Plymouth Volare rocked a surprising stick. And a V8 too! It also threw down with rear-wheel drive and a wagon body that wasn’t half bad looking. And lastly, it was down with the brown. Talk about your perfect storm. Of course, its price might have proven tempestuous as well, but in the end,it didn’t and the car broke our streak of Crack Pipes with a very satisfying 62% Nice Price win. Let us all rejoice. Okay, that’s enough rejoicing, we’ve got work to do. In fact, today’s 1984 BMW 733i makes you work to drive it, offering up a rarely seen five-speed stick amongst all the leather and wood and coldly Germanic ergonomics that make up the classic E23 interior. If you want to get a good look at that interior on this car you’re pretty much SOL as the seller seemed intent on taking interior shots that only a cat could appreciate. They’re so dark and haphazard that it gives you the impression that he just threw the camera in there and then shook the car around hoping the shutter button would get punched a few times. Not only that but he did it under the cover of darkness because who wants the neighbors seeing you do such a thing? What we do see is that there’s a sport steering wheel in there and that all the seats are seemingly intact. At least we get some nice shots of the exterior to help with our judgement calling, and aside from some dubious decals on a rear door quarter window and a missing center off one of the basket weave alloys, it all looks reasonably tidy. I’ve always liked the looks of the Ur 7-series, what with its shark prow, proud Hofmeister Kink, and elegant proportions. It’s really the definitive big Bimmer. Unfortunately, most that came here to the states arrived with a fun-sapping automatic. This one however, sports a five-speed stick making it sort of like Clark Kent with a flash of S poking out of his button-down shirt. The ad notes that the 3,210-cc M30-powered car “runs great, drives, stops” because of course it does. It goes on to note that the car swaddles its occupants in black leather (some wear on the driver’s side, but only your cat would know it from the pictures) and is imbued with power everything. Mileage is something north of 219K as the ad notes the speedo and odd have given up the ghost. Aside from that there’s no mention of any major or minor issues with the car and it has recently passed the Oregon DEQ test, so it’s smog compliant and ready to transfer title. To transfer that title to you, there’s the small matter of a $1,700 check that’ll need to be written to the seller. That price and the limited description in the ad get my spidey senses tingling, but then I’m suspicious like that. What do you think about that price for the car as presented in its ad? Does that seem like a screaming deal for a Seven with a Five? 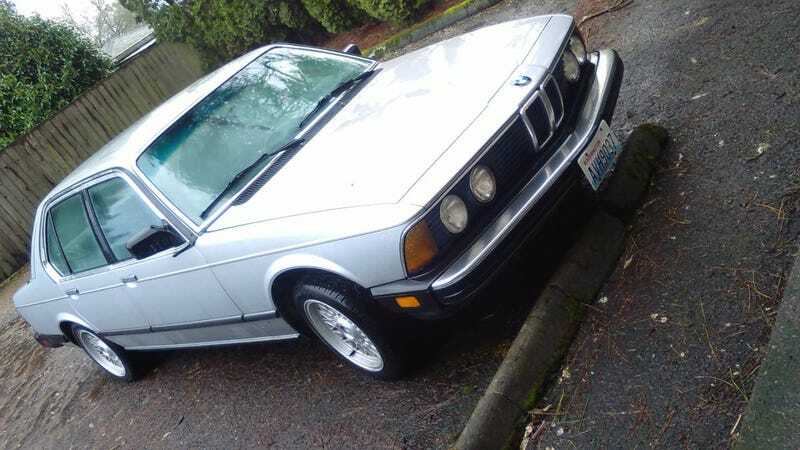 Or, is this an old Bimmer with a price that’s that’s not a winner?